All adventures are tailored to suit your abilities and expectations. From stags and hen parties… to groups of friends, couples and individuals. 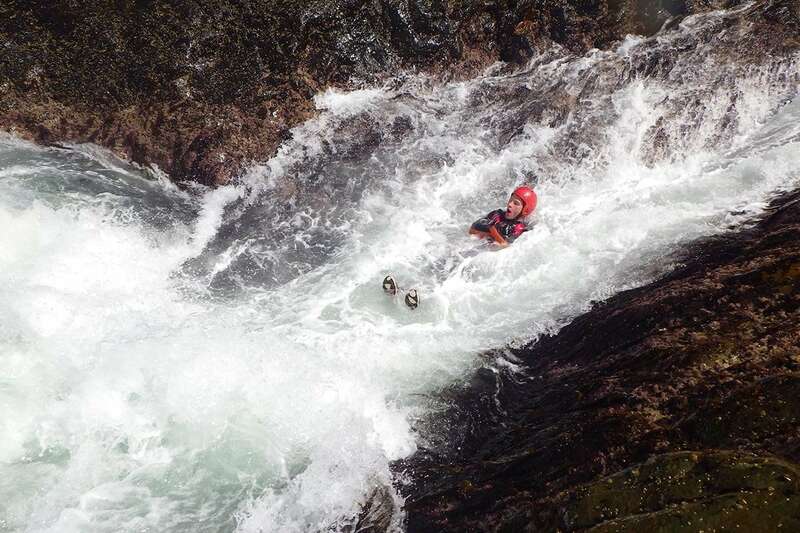 Your guide will select a route with plenty of cliff jumping, sea level traversing and water features. 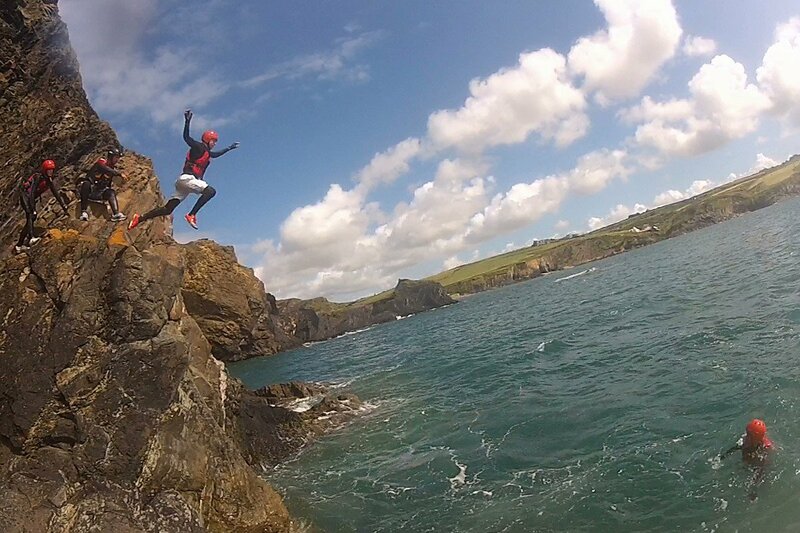 The Pembrokeshire coast has a plethora of cliff jumps and play spots for you to test your adventure limits. Starting small… belly flopping and stunt jumps, gentler water features…. gradually getting higher and bigger. All elements are optional but your guide will be close at hand to encourage and sometimes fish you out! 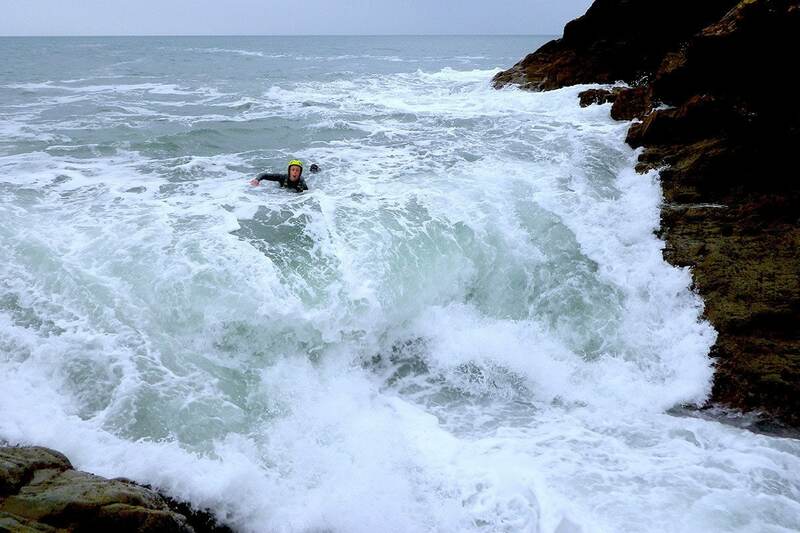 Possibly the most fun you can have in a wetsuit! 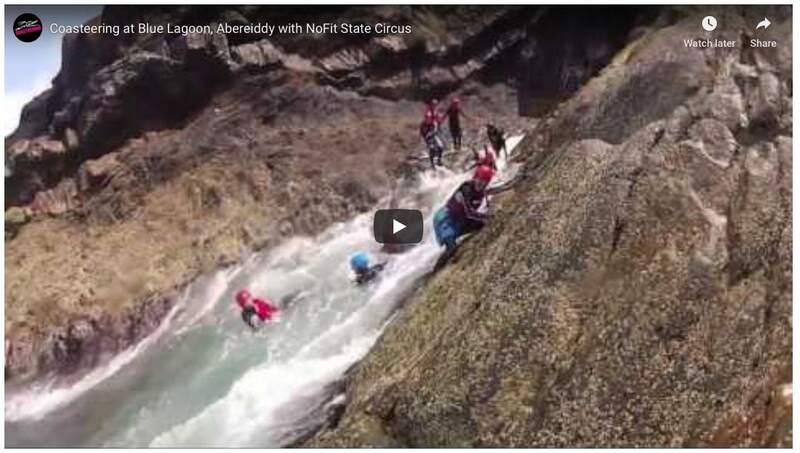 Jumps range from zero to 40ft, all cliff jumps are optional. How high will you go? When the rocks run out, jump in. Belly flopping optional! When the wave gets you, hold you breath & go with the flow! 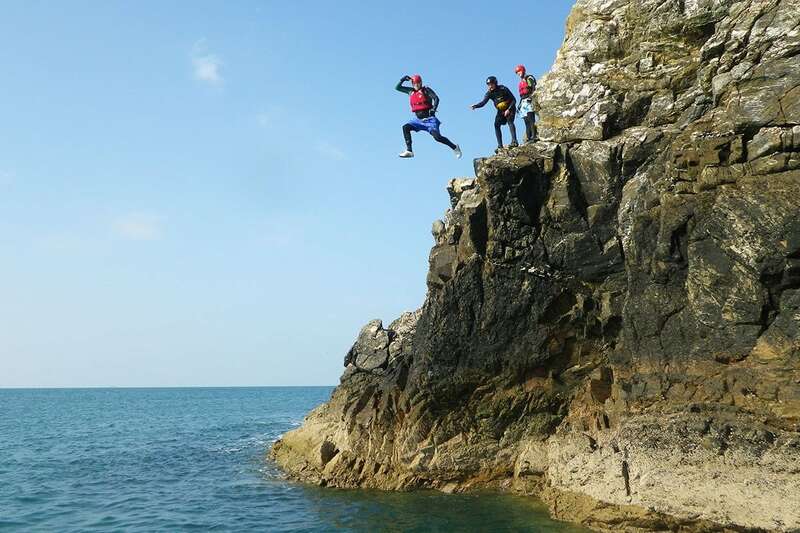 3, 2, 1 and LEAP into Wales' Celtic Sea. Will you scream? "They're all crazy, but in the right way!" 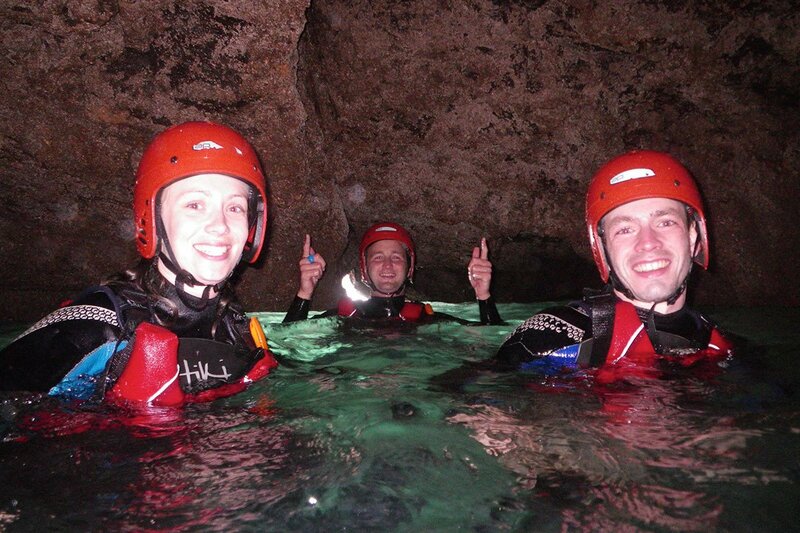 At low tide swim through sea caves, visit Pembrokeshire's hidden secrets! But fun is a close second! 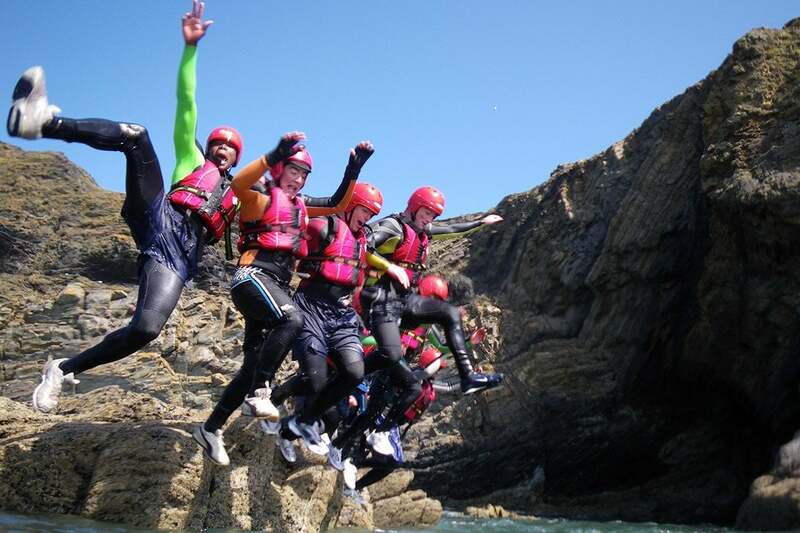 Pembrokeshire Coasteering is an outdoor activity exploring the coast at sea level. 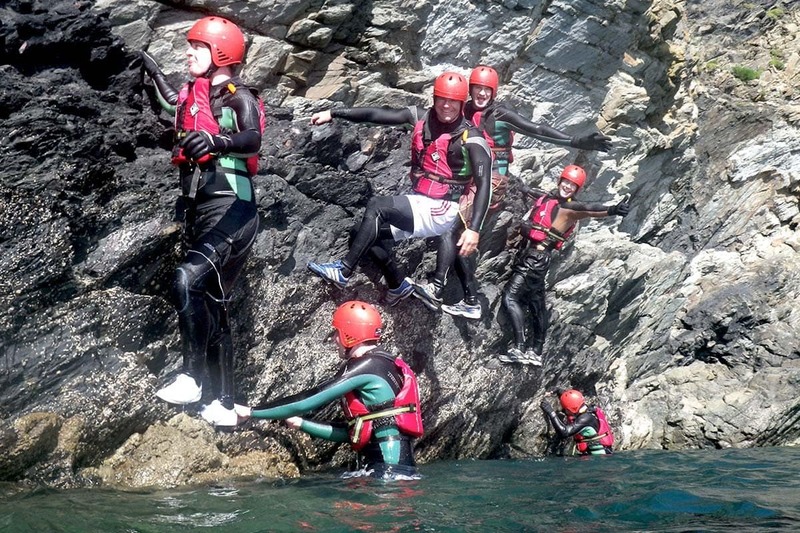 All Coasteering sessions with Celtic Quest are tailored to suit your groups expectations and abilities and can include cliff jumping, scramble climbing, adventure swimming, rock hopping and more. 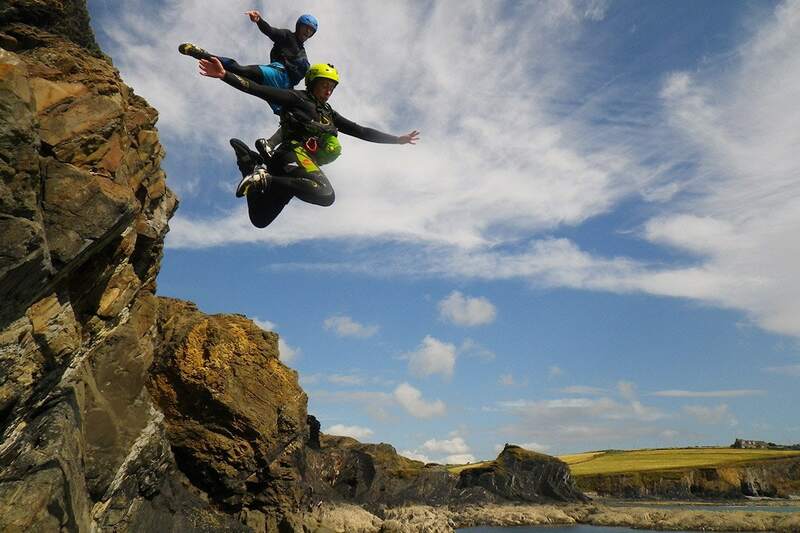 Where can we do Coasteering? We meet you at Abereiddy beach, just North of St Davids. 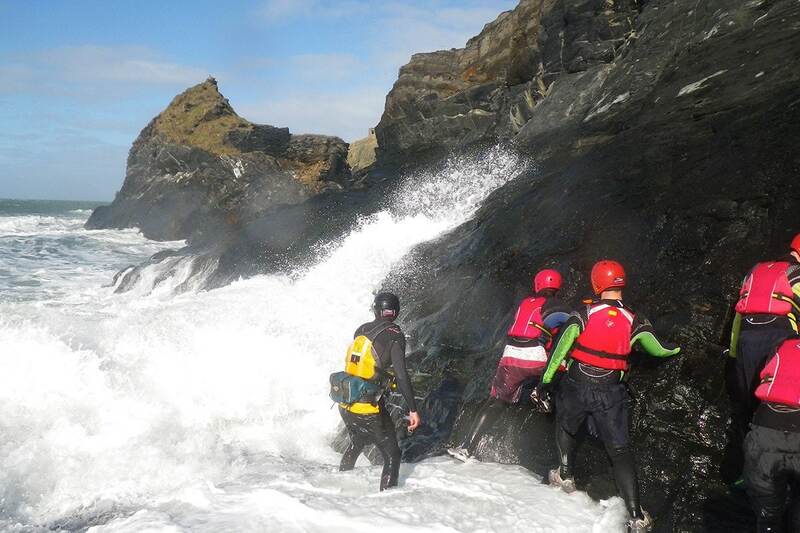 Visit the Contact us page for a map & directions to Abereiddy bay, North Pembrokeshire. Exploring the right hand side of the bay, its got the lot, small to BIG cliff jumps, scramble climbing, water features & more. 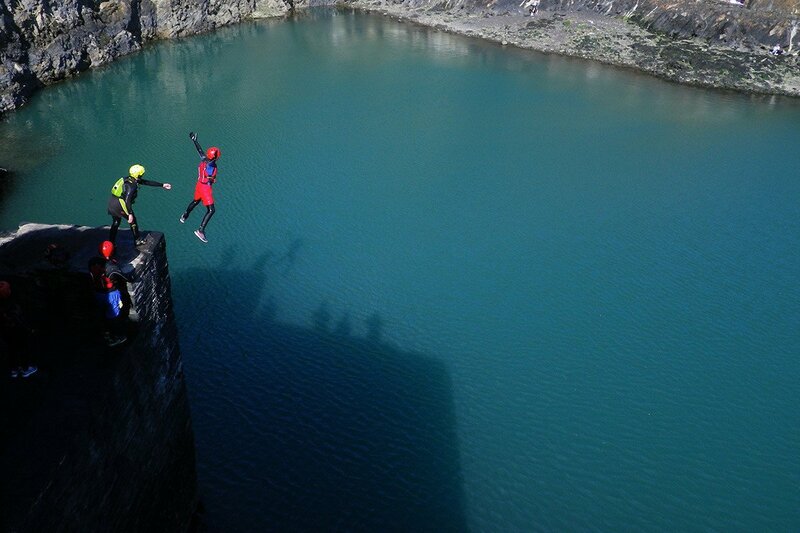 We finish the session in the Blue Lagoon (Red Bull Cliff Diving World Series location 2012 & 2013). 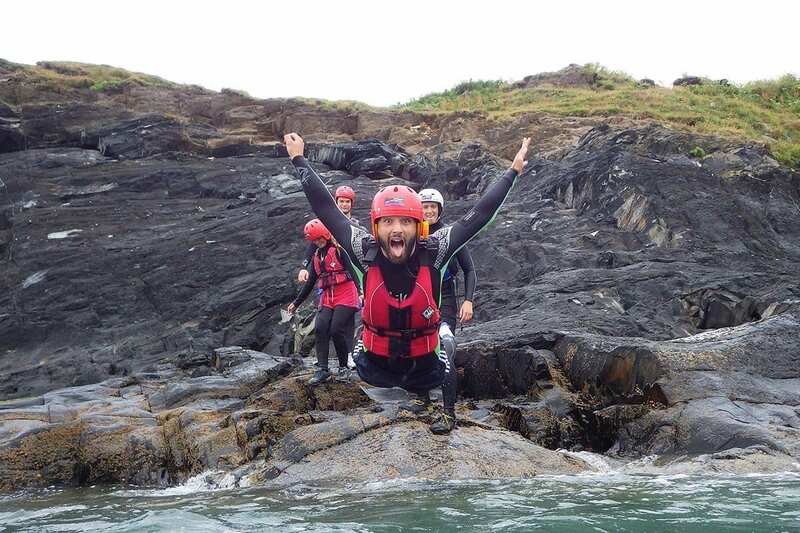 When can I go Coasteering and how long does it last? 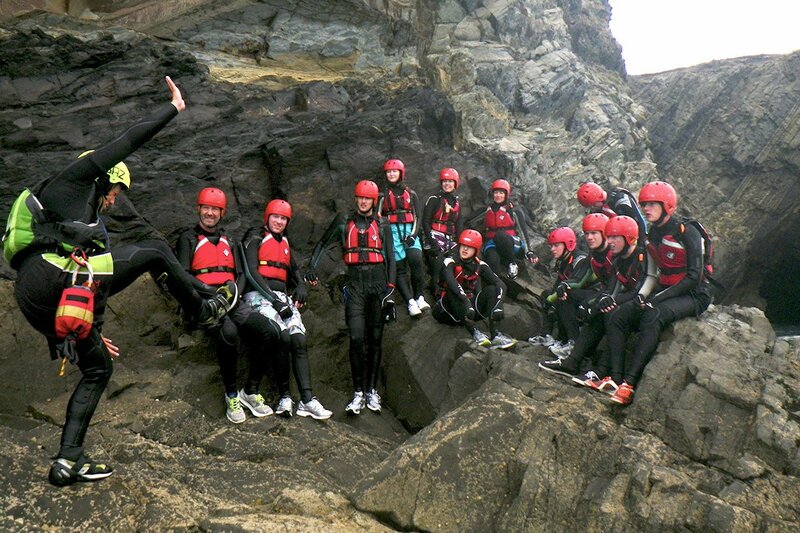 Celtic Quest offer Coasteering adventures all year round. Meeting you at the beach gives us more time to spend exploring the coast. We’re normally in the water for approx 2-2½ hours. Add to that getting changed before and after…it’s a good half day activity. Summer Adventures run 9.30am-12.30am & 2pm-5pm daily (March-October) Winter Adventures start at 10am or 1pm daily (November-February). 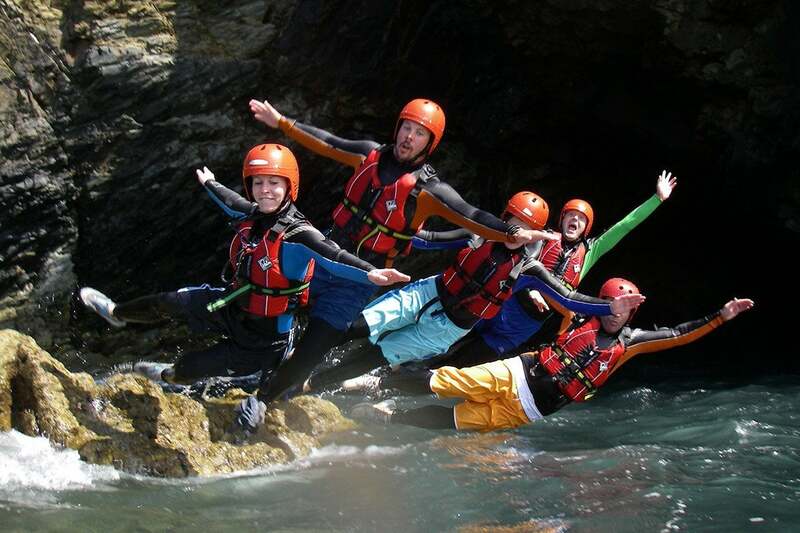 How much does Coasteering cost? Standard price is £45.00 per person, group discounts are available. For full details and how to book click here. What's the maximum age and minimum group size? Our minimum age is 8 years. Our record so far is 76 years young. 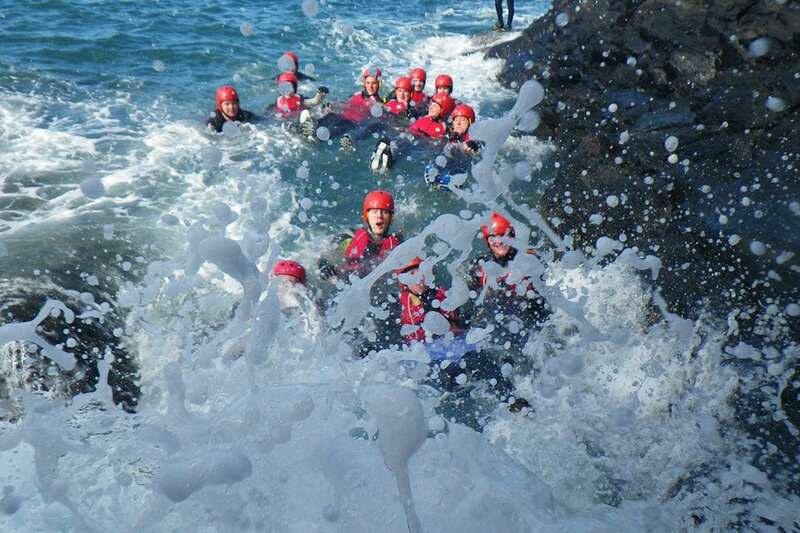 If you’re happy to jump in the sea (not necessarily from a great height) then we’ll help you tick that bucket list. We have no minimum group size, individuals and small groups are welcome, we can also accommodate larger groups. No problem, your wetsuit and buoyancy aid are super floaty, so you just go with the flow. Your Guide will be close at hand throughout the activity, choosing a route that’s suitable for everyone and all elements are optional. Will I get cold and what if it's raining? Your first dip will be refreshing, after that the wetsuits get to work and will keep you toasty warm throughout your adventure. 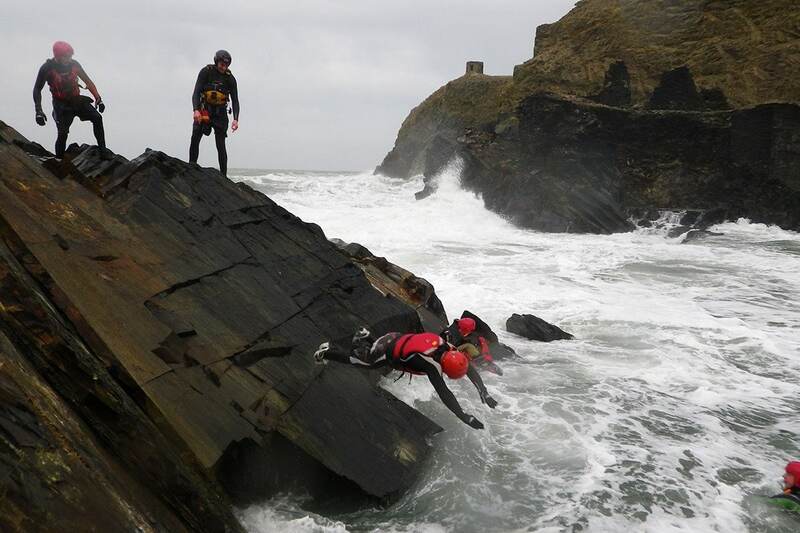 Rain or shine – we can go Coasteering, as you’ll be getting very wet anyway. You’ll need swimwear, a towel, an old pair of shorts (to wear over the wetsuit) and a pair of old trainers (we don’t recommend wetsuit boots or beach shoes, trainers are preferred). We provide the rest, including – winter steamer wetsuits, buoyancy aids, helmets, neoprene wetsuit gloves, hoods and socks. My partner and I went for an afternoon Coastering at the blue lagoon and it was genuinely one of the best adrenaline experiences we have had!! It was so amazing because of the way the leaders interacted and encouraged as well as the truly amazing coastline! Thank you so much and we will definetly be back! "Old farts go for it!" In our mid 50’s and late 40’s we stood out like sore thumbs when the rest of the kids there were teens. This didn’t stop Chloe and her brother giving us the best experience that we have had in Wales to date! We were fully involved and did everything that the kids did! Jumping, climbing and penguin diving. The activity is amazing and everyone should have a go - I have arthritis in both knees but don’t hold back is my advice . "You'll do things you never thought you could!" Amazing from start to finish, all health and safety announcements made it was just one long giggle-fest after that. Cleo and Jerry were great hosts, showing us all the various jumps and always encouraging, never pushy.. It's one of the best things I've ever done, I'm currently recommending it to everyone I know! Simply awesome!